There has been serious resistance to open cast mining and the use of coal for electricity generation in Lusatia and the Rhineland for several decades. Ende Gelände sees itself as one of many forms of resistance against Europe’s greatest CO2 producers. The idea of Ende Gelände is to use critical mass as opposed to blocking diggers in small groups. We aim to enable lots of people to go a step further than demonstrations and human chains – and actively prevent CO2 emissions. 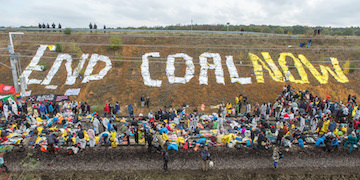 We’re willing to discuss our aim of blocking the mine and preventing the extraction of coal and its use in energy generation in public in advance of the direct action – among other reasons because we think our concern is totally legitimate given the urgency of action on climate change. There will be a climate camp. You are all very welcome to attend. Make sure to take a sleeping bag and a camping mat with you and, if you can, also a tent.